You may not be ready for your holiday party but the time to start thinking about it is now. Experts agree that you need to book the venue for your holiday party early because companies snap them up months in advance. But you shouldn’t stop there. There’s a lot that goes into a company or organization’s holiday party. You want to make certain your employees and guests have a good time, while at the same time showing your company at it’s best. If you’re looking for for a party rental expert with great customizable items for your company, come to NY Party Works. NY Party Works is the area’s premier party planning and rental company. We’ve been in business since 1993 and we’ve helped all kind of companies large and small companies plan holiday affairs. We’ll work out details with you and we’ll work within your budget to create something unique and spectacular for your organization. We can help plan the entire party with Total Event Planning and we can put your company’s stamp on the event with customizable items. Let us tell you how. There are many ways to show off your corporate logo, branding or party theme to your guests, and NY Party Works can help you do it all. We can also give you items with photos of your guests or other logos such as their favorite sports team. We can customize so many items for you. One popular option are our iCases. Our customizable phone case will give your guests a personal touch and they’ll remember your holiday party every time they use their smartphones. It’s one of many unique photo items we can create for you. 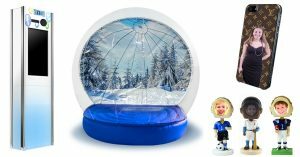 A perfect choice for holiday parties is our life-size inflatable snow globe. Step into our winter wonderland and have your photo snapped with friends and loved ones. When you rent one of our inflatables there will be a staff member operating it. Remember NY Party Works is fully insured and always up to date on licensing and safety training. Another great way you can customize photos is with one of our Photo Booths, from our classic strip booths to hi-tech IT booths. We can put your logo in the background. There are many other customizable items you can get for your party from Edible Chocolate to Meme Pillows and Movie Posters. They make memories and also help potential clients remember your company. NY Party Works can also customize the look of your event. We can provide you with Lighting and Special Effects, Lounge Furniture and Decorating Services. It’s a good idea to book right away. The holidays will be here before you know it. NY Party Works can plan the whole event or we can supplement your planning with some of our most popular customizable items. And if you have any questions about how to fulfill your vision or to stay within your budget, just ask. To get started, contact NY Party Works today.